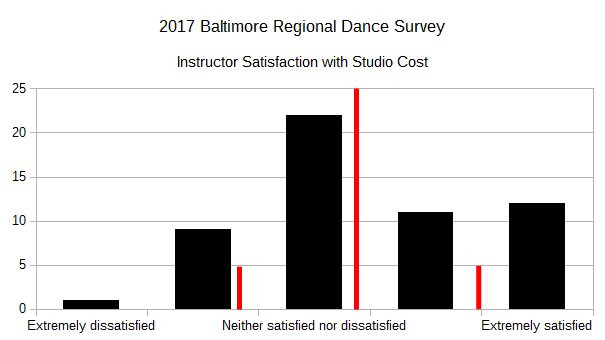 When it comes to cost, we have one much-suffering instructor in the pool of respondents, but in general, respondent instructors are on the satisfied side of neutral (Average = 2.44, σ = 1.06). Availability comes in just about the same as Cost – our respondents are still slightly positive, if a bit more varied in their opinions (Average = 2.42, σ = 1.23). Studio Quality came in just a bit higher than Cost and Availability (Average = 2.51, σ = 1.28). Studio Amenities also came in about the same (Average = 2.27, σ = 1.20). But in the realm of services, the consistency breaks down just a bit and we’re on the dissatisfied side of neutral (Average = 1.91, σ = 0.96). 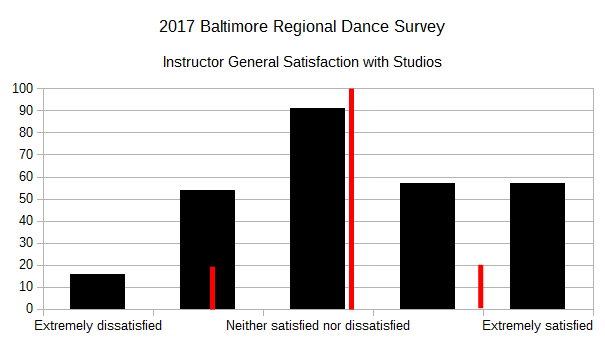 To some extent, I’m sure that the respondent pool bias toward older and more experienced instructors plays into both the consistency and the overall satisfaction reported. 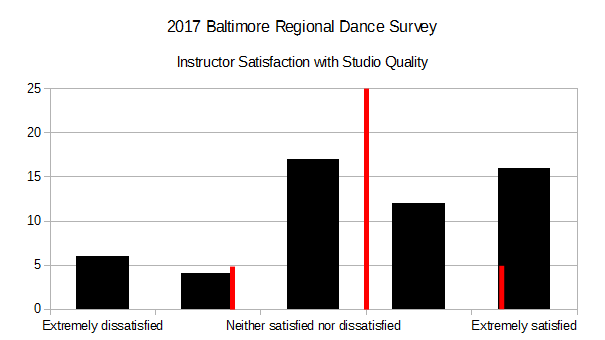 We are generally looking at instructors with long careers, and they’ve had some time to fix the challenges they have faced when it comes to the studios with which they decide to work. It will be interesting to see if less-experienced instructors maintain this pattern. It looks like there are 7 respondents that really need some help with their instructional spaces. 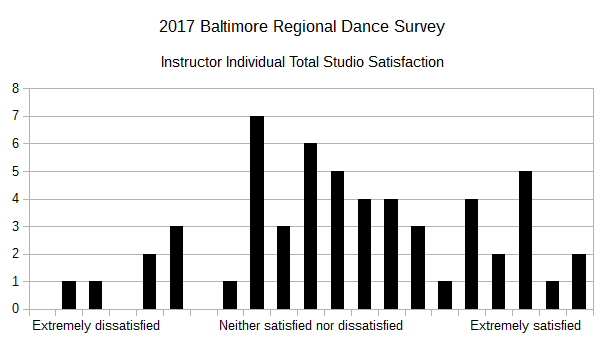 While I’m mostly sticking to the data here, if any of those much-suffering instructors feels like reaching out, I’m happy to help work the specific problems where possible.